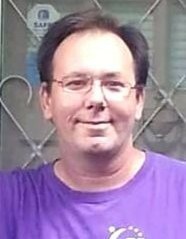 James W. "Jamey" Mitchell, Jr.
James W. "Jamey" Mitchell, Jr., 51, of Scottsville, KY passed away Monday, March 25, 2019 at his sister's residence. The Scottsville, KY native was a former employee of General Electric and Dollar General and a member of Living Waters Pentecostal Church in Westmoreland, TN. He was a son of the late James Wesley "Doug" Mitchell, Sr. and Linda Sue Pardue Mitchell. Funeral services will be 2:00 P.M. Thursday at Goad Funeral Home with Bro. Dewayne Taylor officiating and burial in Mt. Pleasant Cemetery. Visitation will be 12:00 P.M. to 8:00 P.M. Wednesday and after 7:00 A.M. Thursday until funeral time at Goad Funeral Home.